This article covers free online doc translator websites. These websites can translate any .doc or .docx format file into any language. The file layout is also preserved during translation. All the listed websites are pretty simple to use, requiring you to just upload a doc or docx file. Then choose the language in which you want to translate this doc file. After translation, you can easily download the doc or docx file and save it to your computer. The best part of these doc or docx file translation websites is that you do not have to sign in to create a account. You can just open the website and start using them. Also, the layout of your doc file is maintained even after translation. Here are some nice free online doc translators which you can use to translate online Free. Let’s look at these doc translators below. OnlineDocTranslator is a nice doc translator website. When you launch this website you will see an interface like the one seen in the screenshot above. This online document translator supports many formats like .doc, .docx, .ppt, .pptx, .xls, .xlsx, .odt, .ods, .odp, .pdf, .srt, and .txt. In this article we are only focused on .doc and .docx only. So we will translate a doc file. The doc file layout is also preserved. You are not required to register or sign up with the website and there is nothing to install either. Just go to the website and click on the translate now button to start your doc translation. When you click the translate now button, you will be taken to the translate form page, which looks like the screenshot below. On this page you will see a box at the top of the page where you can drag & drop your doc or docx file or click the upload file button. Select your file and it will be uploaded to the website immediately. Then below the box you will have the translate option. Here the input language of the doc file is automatically read by the website. In the above example, the input language was English. Now from the second drop down box choose the language you would like your doc file to be translated into. The drop down box has lots of languages you can translate this doc to. Once you have chosen a language of conversion, then go ahead and click the translate button. It will take a few seconds and your doc will be translated into the language of your choice. You will get a download link at the bottom of the page. You can click this download link and download the translated copy of the doc file to your computer. When you open the translated doc file you will notice that the text has been converted to the language of your choice and the layout of the doc file is still intact. Google Translate can also convert your doc files for you. When you land on the Google translate page, you will see two tabs above the translate box, one for text translation and second for document translation. This can be seen in the above screenshot as well. Select the document tab and you will be shown what all types of documents it supports right inside the translate box. The document formats it supports are .doc, .docx, .odf, .pdf, .ppt, .pptx, .ps, .rtf, .txt, .xls, and .xlsx. Notice that doc and docx are supported. Click on browse your computer button. From the browse window select a doc file which you would like to translate. The doc or docx file will be uploaded to this window and will start showing in the box given. The language of the doc file will automatically be detected. You have to select the language you would like to convert this doc file to on the right hand side. Now your window will look like the screenshot below. To go ahead with the translation click translate button. As soon as you click the button your file will be translated in the language of your choice. In the above example, we uploaded a English doc file and translated it into Japanese. The conversion was quick and the format of the doc file was maintained. So Google translate can also be a good option to try. DeepL is a nice website to translate doc or docx files to any language of your choice. When you go to this website you will see an interface like the one seen in the screenshot above. On the left side box, you can upload your doc or docx file. When you click in the box a browse window will open up and let you select a doc file to upload. In the right side box choose the language of translation. In case you did not choose a language while uploading a doc file, you will see a screen like the one shown in the screenshot above. The input file language is automatically detected. You will be asked to choose a translation language from the ones given. Choose one language by clicking on it. Once you do that, a download pop up window comes up, asking you to download your translated doc file. You can save this translated doc file to your computer. There is a download link present in the right side box as well, which you can click to download file again. Opentrad is a nice website to translate doc or docx file in to various languages. When you open this website you will see an interface like the one shown in the screenshot above. In step 1 you choose the input language and output language for your doc or docx file. In the second step you can upload the doc or docx file. If your file is less then 5 MB then it will be a free translation for you other wise it is a charged translation. The third step let’s you initiate the translation process. 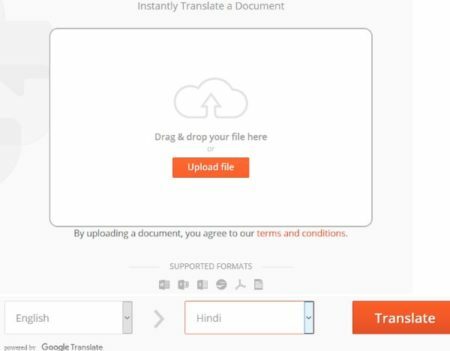 When you initiate the translation, you will get a download link to download your translated file to your computer. You will see a screen like the one seen in the screenshot above. Click the download button to save your translated doc or docx file to your computer. These are some free online doc translators. All these website are free to use. You can easily translate the language of your doc or docx file using these websites. All you need to do is upload your file and choose the language you want it to be converted into. That is it.